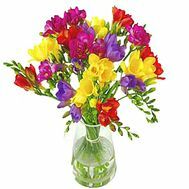 A bouquet of freesias is a gift that is multifaceted and charming. 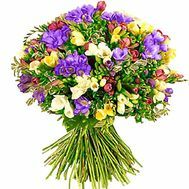 A small bouquet of this flower is capable of causing touching tears and moments of spiritual joy and ease. 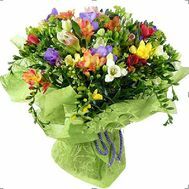 A huge buketfresii will become a receptacle of feelings and emotions that are difficult to express in words. 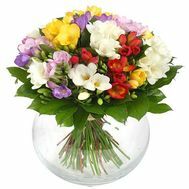 It is at moments when words are not enough, we recommend buying freesia - a luxurious, sensitive and versatile flower. 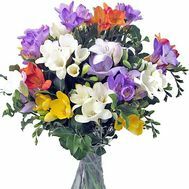 Freesia is a flower that has come to us from Africa and America. 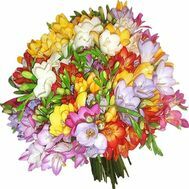 As early as the 17th century, bouquets of freesias were valued for their weight of gold and life. 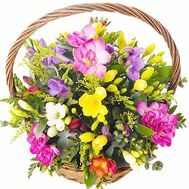 She was decorated with houses and royal chambers, because she is considered an aristocratic flower, meaning at the same time tenderness and sensitivity. 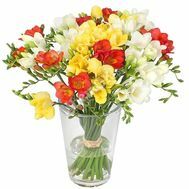 In case you want to express deep respect, recognition and interest in a person - choose luxury freesia. 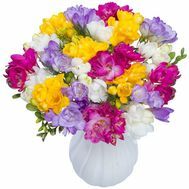 Buy them at any time you want in our store. 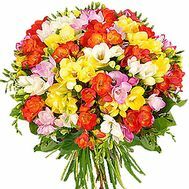 This flower will be an excellent gift for birthdays and anniversaries to beloved women and mothers. 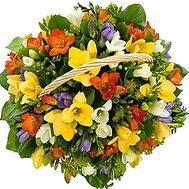 Also freesias will be appreciated by your relatives, for example, brothers and sisters for family holidays or simply on the occasion of a meeting after a long separation. 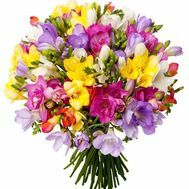 Order a bouquet of freesias with delivery - and you will remain in the memory and heart of the person who is going to give them away! 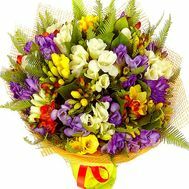 Experience: we have been working for more than 10 years, and therefore we have many completed orders. With customer feedback you can find in the right section on the site. And also each of our customers can appreciate the democratic prices, pleasant discounts and seasonal promotions from the store! 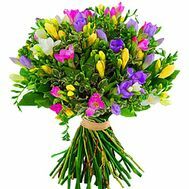 If you want to surprise your relatives and friends pleasantly - buy flowers in our store. We will not only help to choose an additional gift for them, but we will also present joy and happiness in each of their manifestations!